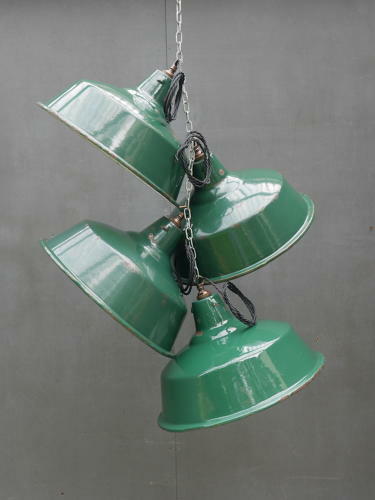 A run of early vintage industrial pendant lights in green & white enamel. Great shaped, honest industrial pendants with vented uppers & a pleasing amount of wear. Rewired in twisted black flex brass bulb holders & hanging hooks. Four now available, priced per pendant. Wear commensurate with age, good overall & nicely aged. UK courier service available at £12 tracked & signed for 24 hour delivery regardless of number purchased.